Vault of Light: Monkey business. 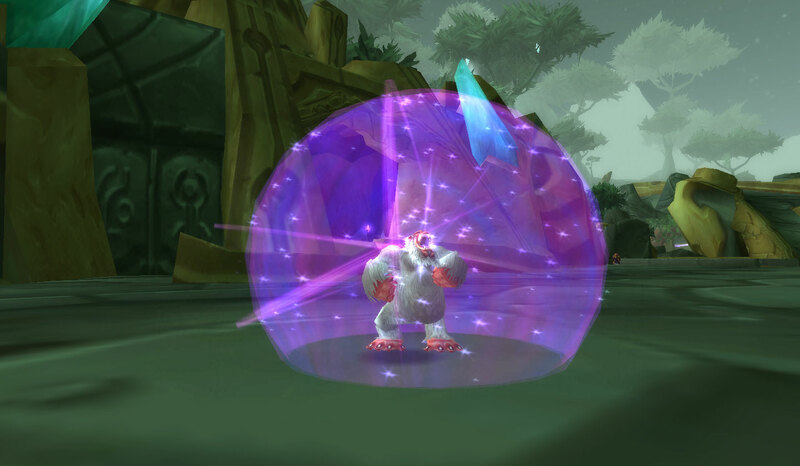 Now that we're into Druid week of the alt appreciation week I've been doing a few Wrath of the Lich King dungeons for a few last bits and bobs of transmog gear and last night the Super Simian Sphere dropped for me while in Halls of Lightening! It's a real shame this little beauty is bind of pickup as my Priest would love to add this to her collection of useless tat. I'm enjoying Druid week! I've been neglecting my Druid for a while so I'm trying out Guardian it's pretty scary but fun. Thank you! It's been fun so far, just a bit of a mess trying to remember what everything is keybound to! I press cooldowns randomly by accident! Could be worse. Thank you! 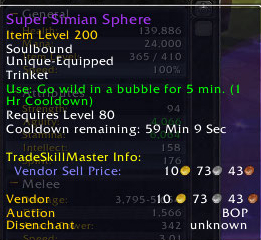 It's a shame it's a trinket, when you remove it the effect drops off. Boo! My friend just got this item this weekend when we ran a raid for a mount! I made him run around so I could take a bunch of pics to make a post.